The average adult head has about 100,000 to 150,000 hairs. Normally the adult loses up to 100 of them a day. At any one time, about 90% of the hair on a person's scalp is growing. Each follicle has its own life cycle that can be influenced by age, disease, and a wide variety of other factors. As people age, their rate of hair growth slows. Pattern hair loss, is known as male-pattern hair loss (MPHL) when it affects males and female-pattern hair loss (FPHL) when it affects females. Female-pattern hair loss more often causes diffuse thinning without hairline recession; similar to its male counterpart, female androgenic alopecia rarely leads to total hair loss. Scarring alopecia result in permanent loss of hair. Inflammatory skin conditions (cellulitis, folliculitis, acne), and other skin disorders (such as some forms of lupus and lichen planus) often result in scars that destroy the ability of the hair to regenerate. Hot combs and hair too tightly woven and pulled can also result in permanent hair loss. Alopecia areata is a chronic inflammatory disease which affects the hair follicles and sometimes the nails. Alopecia areata usually presents as patches of hair loss on the scalp but any hair-bearing skin can be involved. The nails are involved in about 10% of patients referred for specialist advice. Trichotillomania, the most frequently in children, it is a psychological disorder in which a person pulls out one's own hair. 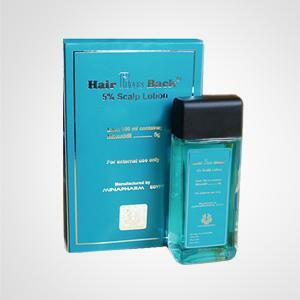 Hair Plus Back contains 2 % MINOXIDIL, the only FDA approved product for Hair regrowth. 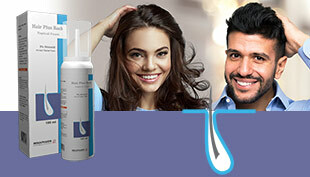 - Use twice daily on healthy dry scalp, holding spray nozzle aimed away from eye and about 1 inch from scalp. Can I apply Hair back before shower?